Michael Jordan’s professional bona fides are well known—Master Sommelier and CWE (Certified Wine Educator), one of only 15 people in the world to hold both certifications. Jordan appeared in Time this week, administering the sommelier test to a bemused Joel Stein at his request. Lucky for O.C., he plies his considerable expertise as vice president of beverage at The Ranch Restaurant & Saloon in Anaheim, the luxurious, haute cowboy hangout Extron Electronics owner Andrew Edwards installed on the ground floor of his company’s six-story Anaheim headquarters. Since it opened, part of The Ranch’s story has been about its farm, the Edwards Ranch Estates growing grounds in Orange Park Acres that supplies fruit and vegetables for the restaurant. On Sunday, I was lucky enough to be among those invited to the restaurant’s annual farm-to-table supper. Even before we sat down to the many fabulous courses from executive chef Michael Rossi and his team, I learned something surprising—Michael Jordan is as mad about tomatoes as he is about wine. Walking the acre-plus property, Jordan familiarly introduces each tomato variety we see, from extra-tiny cherries to beefsteak size, in every color you expect and a few you might not. Later, when platters of tomatoes, dressed only with Napa Valley Olive Oil and Maldon salt, are placed on the table, Jordan waxes eloquent about the particular qualities of each. A special favorite, a large, meaty, ribbed variety that he calls his Suitcase tomato, was brought back from Italy. 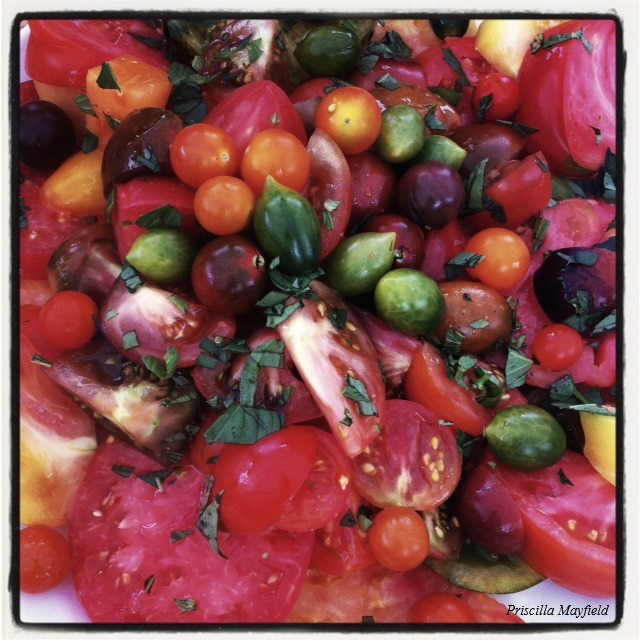 An Edwards Ranch Estates tomato salad will be offered as a special at the restaurant, but you can follow The Ranch’s approach at home by arranging slices of room-temp tomatoes in multiple colors and shapes on a platter, and dressing with great olive oil and crunchy sea salt. I’d add a generous grind of black pepper, and some might want a shower of herbs. But no more than that. For this simple salad, let the tomatoes do the talking. As summer rolls on, there’s plenty of time—and plenty of tomatoes—for more complicated preparations.